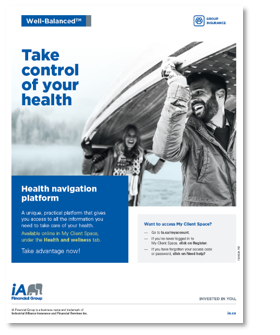 Whether online or over the phone, plan members have access to a variety of resources to help them take control of their health, thanks to the health navigation platform. The health navigation platform is included in Well-Balanced, our health and wellness offer, which includes several other tools and services. You have access to promotional materials to help your plan members learn about these services. These materials are available in the plan administrator My Client Space (our secure website) under Health and wellness - Toolbox. To learn more about each Well-Balanced service, visit our website. * The health navigation platform is available to groups with an iA Financial Group health insurance plan and that meet the following eligibility criteria: Plan member information is stored in iA Financial Group’s systems (we manage the in-force) AND plan members have access to My Client Space.